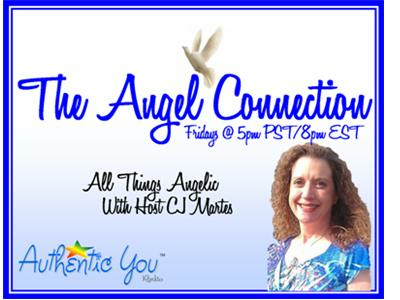 The Angel Connection with CJ Martes - Debut Show! The Angel Connection is a weekly radio show that examines the powerful impact of angels in our lives. Through guest interviews, information-sharing, and live call-in angel readings, this show provides a resource for learning more about different types of angels and how to work with angels in your everyday life. Debut Episode! This week’s debut show offers an intimate look into CJ Martes’ personal story about angelic intervention in her own life. Learn about her journey as she tells her own story for the first time publicly! Most do not know that she was visited by 13 Angels over 13 years ago and her life has never been the same! The second portion of the show is reserved for listener call-ins to get information about their own angels from CJ Martes! Visit www.CJMartes.com or the official show page at www.AuthenticYouRadio.com/The-Angel-Connection.